Chimpanzees can be a difficult animal to recreate as a model, although this can make an enjoyable project for children of all ages. It can be helpful to look at photographs of real chimpanzees to take note of the animal's coloration and features such as the prominent, rounded muzzle and long arms. 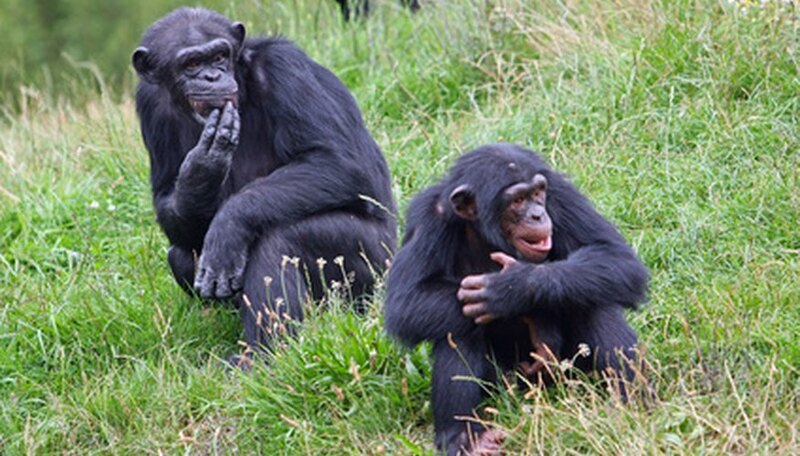 The chimpanzee often appears in a sitting position with the hind legs folded close to the body. You can recreate this pose using paper mache. Scrunch up a sheet of paper to make an oval shape for the chimpanzee's body. Tape the form into place thoroughly using masking tape. Make a ball of scrunched up paper for the head and again tape into place. Tape the head onto the smaller end of the oval. Make a smaller scrunched up ball of paper for the chimpanzee's rounded muzzle. Ideally this should be a third of the size of the head. Tape this into place. Tape two small pipe cleaners to the bottom of the chimpanzee's body and fold them slightly to achieve the desired position. Tape two longer pipe cleaners to the upper part of the model's body in the appropriate place for arms. Bend the arms to create the desired pose. Mix one part wallpaper paste with three parts water to make the paper mache paste. Rip up two sheets of newspaper into thin strips. Dip each strip into the paste and apply them to the model. Continue to do this until the model is completely covered. Merge the rounded muzzle onto the face with the paper mache strips. Thicken the arms and legs by wrapping the pipe cleaners in several strips of newspaper. Leave the model to dry for 24 hours. Paint the model of the chimpanzee using as much detail as you like. Tape a semicircle of card to either side of the head to form ears, or simply draw or paint them onto the model. Leave the paint to dry.